Stuarts London is one of the best regarded London destinations for quality Men's Fashion. Established in the 1960's, Stuarts London has developed a reputation as being a leading retailer for new trends and styles. Stuarts London has over 120 brands offering products including jackets, shirts, tops, jeans, footwear, bags, accessories and grooming. 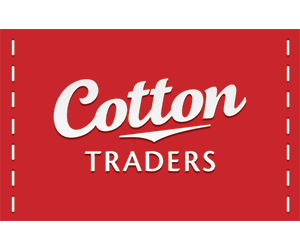 Cotton Traders provide a huge range of leisure clothing, footwear, exclusive licensed product ranges for big names like BUDWEISER & GUINNESS, classic ruggers and team replica shirts, along with nightwear, bedding and other household textiles. The company are still very active in the rugby world, providing a range of 'tough as the game' rugby Teamwear, and as official suppliers to Leicester, Gloucester, Sale Sharks and Barbarians, among others.